I recently spent three weeks ( half 2008) gathering information about the anti-displacement movement in India. 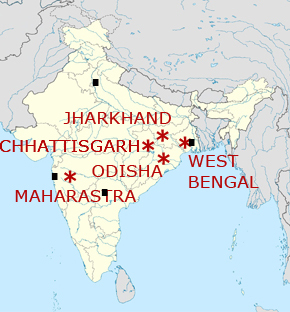 As a guest of Visthapan Virodhi Jan Vikas Andolan (People's Movement against Displacement and for Development), I traveled across five states in central and eastern India visiting the sites of proposed industrial and mining projects, Special Economic Zones and real estate developments. I spoke with hundreds of villagers who are threatened with displacement and with many dedicated activists who are helping to organize the people's resistance. The villagers I spoke to, tribals, dalits (untouchables) and members of "other backward castes," told me that the lives of their families are at stake. Rapacious industrial and mining enterprises, supported by the state and central governments, are trying to grab fertile agricultural land. When bribery doesn't work, the industrialists and government officials send in the police and hired goons to terrorize the villagers into submission. In return for their land, farmers are being offered paltry monetary compensation that will be gone in a year or two (villagers without land will get nothing); illusory promises of jobs in the new industries; and for a few, "relocation colonies" where they do not have enough land to farm to support their families. The result of these threatened displacements, like the displacements of the past 50 years, is the creation of millions of new landless farmers who will end up swelling the ranks of urban slum dwellers. The overwhelming response of the villagers I spoke to is that they would not give up their ancestral lands under any conditions. As many put it, "We will sacrifice our lives, but we will not give up our land." 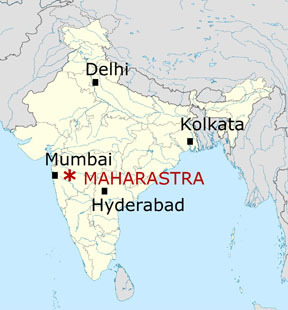 map My first destination was a hunger strike in downtown Mumbai, which was aimed at the Reliance company and the Maharastra state government. Reliance had set up a large Special Economic Zone (SEZ) composed of 35,000 acres, where it has plans to build an upper and middle class "New Mumbai" on top of rice fields. This SEZ will displace 45 villages and 250,000 people, and is a focus of the anti-displacement movement in Maharastra. Based on a law passed by the central government in 2005, SEZs are usually large industrial projects, often involving foreign investment. However, Reliance hasn't given any indication that it is interested in industrial development. Reliance is instead trying to take advantage of the many profit-making opportunities of SEZs. They offer hefty exemptions from taxes for 10 years, no tariffs or duties, and exemptions from most labor legislation. Since SEZs are treated as "public service utilities," strikes are illegal. SEZs are essentially foreign enclaves on Indian soil. Over 500 SEZs have been approved by the Central and State authorities. Most of them are under construction or in the process of land acquisition. 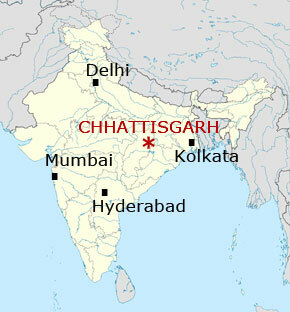 map My next stop was Chhattisgarh, where multinational companies are moving in to exploit the state's rich natural resources and cheap labor. In the capital city of Raipur, I met with two groups of women, who shared their stories of protecting their villages from industrial encroachment. One group of women live in a slum of 3,000 people located in the middle of one of Raipur's industrial areas. The slum dwellers are villagers displaced by the surrounding factories. Their area, called Mazdoornagar (Workers' Town), is located near the Woodsworth wood products factory, which wants to take over their land. The residents have responded by demanding official recognition of Mazdoornagar with the right to have municipal services such as schools, water and food ration shops. In the meantime, they have tapped into Woodsworth's water pipes for drinking water, and into its transformers for electricity. These women are active in the Women's Liberation Front, whose slogan is, "We are not flowers. We are the sparks." Another group of women I interviewed has built a separate women's organization that has a committee that runs the school, a committee for demonstrations, a committee to collect funds for village needs such as digging wells, and a campaign against liquor shops and their husbands' habit of wasting scarce funds on alcohol. When I asked them what they wanted for the future, one of the women told me, "We want a good world for our children. We will forge a new identity. The workers and peasants will rule." I also interviewed two women activists who are working with women in remote tribal areas in northern Chhattisgarh to stop large mining companies. One of these women, Sister Bulu, explained to me that "Social activists are trying to organize the people under the repressive watch of the government." One prominent victim of state repression is Dr. Binayak Sen, a civil libertarian and doctor who opposed the forced displacement of 300,000 tribal villagers in southern Chhattisgarh by the Salwa Judum ("Purification Hunt") and has been imprisoned for more than a year. When I asked Sister Bulu what message she wanted me to carry to concerned people in the U.S., she said, "People everywhere in the world should get united. All the intellectuals and thinkers and those who are concerned about the people should join hands with the oppressed, marginalized people to save humanity." Before I left for the Bastar region in southern Chhattisgarh, my guide filled me in on the Salwa Judum. This is not a simple displacement to make way for industry or mining enterprises (though it will ultimately have this result as well), but a counter-insurgency operation aimed at the Maoist forces operating in this area. She explained that after independence in 1947, the conditions of the tribals in the area had remained unchanged. They faced extreme exploitation at the hands of the forest officials and police. In the early 1980s, Maoist cadre from Andhra Pradesh crossed into the area to live and organize among the Gondi-speaking tribal people. Over 25 years, they developed a following of around 50,000 tribals in their sanghams, the mass organizations of the Communist Party of India (Maoist), which was formed in 2004 by a merger of the two largest Maoist groups in India. The Maoists have set up a parallel government in parts of two districts in southern Chhattisgarh. They have driven out the forest officials and police, while allowing in teachers, health workers and government food ration shops. My guide explained that the exact origins of the Salwa Judum, or "Purification Hunt," are somewhat murky, but that in June 2005, a section of the adivasi elite, led by Congress Party leader Mahendra Karma, started organizing to eliminate Maoist influence from several villages. The state government immediately threw its forces behind this effort to pit tribals against each other, arming tribal youth as Special Police Officers to conduct raids on villages that had been identified as "Maoist-affected." During these raids, villagers were ordered to leave their homes, which were burned, and make long forced marches to 23 "resettlement" camps. Those who refused to leave were treated harshly. 538 murders and 99 rapes in three districts are cited in a petition concerning Salwa Judum in India's Supreme Court. This scorched earth campaign eventually extended to 644 "Maoist-affected" villages in the South Bastar region, emptying them of around 300,000 tribal people. In the course of the Purification Hunt, Maoist guerrilla squads retaliated, killing Salwa Judum leaders, paramilitary forces, informers and poorly trained SPOs. The Maoists also attacked an Essar Steel plant in Dantewada district in order to underline their opposition to industrial displacement in the area. Civil libertarians and others who are speaking out are saying that tribal people must be permitted to return their villages without interference, the camps closed down, and the police, paramilitaries and SPOs of the Salwa Judum disbanded. I took a long bus ride to Dantewada district to meet with Himanshu Kumar, a human rights activist and leader of the Varvasi Chetna Ashram to learn more about Salwa Judum. He has played a leading role in exposing conditions in the 23 Salwa Judum camps. He took a few minutes to describe jail-like conditions, where nearly 50,000 people are living in crowded quarters with no work, not enough water and rampant medical problems. There is constant violence in the camps; recently, three villagers were shot and killed by paramilitary forces. Many have escaped from these camps and run away. According to Kumar, since villagers have been returning from the forests to rebuild their homes, the police and SPOs have continued to raid the villages, burning them down two, three and more times. Medecins Sans Frontieres (Doctors Without Borders) has been denied permission to go into these villages and treat people for malaria and other diseases. In this situation, Kumar's group has launched an initiative to publicly resettle the village of Nendra in southern Dantewada district. For three weeks, 20 volunteers had been living in Nendra, pledging to serve as "human shields" if the police returned to force the villagers to leave once again. Along with villagers who had been living in the nearby forest, the Ashram volunteers had started planting Nendra's first rice crop in three years. See www.cgnet.in/FT/humanshield for updates on the Nendra resettlement initiative. I had hoped that Kumar would be able to take me to one of the nearby camps, but he advised against it. He said the District Superintendent of Police was not in his office, and Kumar thought it would be necessary to get the DSP's permission to visit a camp. map In the state of Jharkhand, I visited five villages along with a team from the People's Movement against Displacement and for Development. In the Karna Pura Valley (in the state of Jharkhand), the National Thermal Power Corporation (NTPC), a branch of the Ministry of Energy, has set its sights on developing huge open pit coal mines that would eventually displace 186 villages and 250,000 out of the 300,000 people who now live in the valley. We stopped in the village of Kerigahra, where 100 households grow rice, wheat, vegetables, sugar cane and maize. The land is fertile, supporting up to four crops per year. I met with a group of 30 villagers. They have formed a "Save Motherland Committee" which has organized road blockades and people to people, village to village processions in order to bring neighboring villages into the struggle. They organized a rally of over 10,000 in November 2006. They are particularly proud of a militant action they took in October 2006. After NTPC built an office in their village to start the process of land acquisition, 3,000 villagers gathered and demolished the office, brick by brick, with their hands and feet. After this action, the police filed cases against 550 villagers. The villagers said "the police are working as the right hand of NTPC." After I asked the villagers about their movement, they asked me, "Do American companies displace people? ", "What kind of mining do you have? ", "What effect are companies like Walmart having on small shopkeepers?" and "Is there unemployment in the U.S.?" I came away very impressed by the Jharkhandi villagers I met. 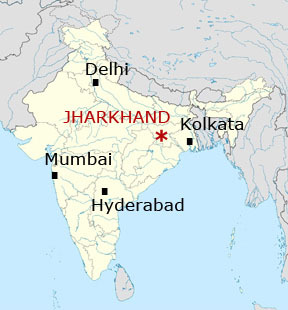 Due to their resistance and the strength of the anti-displacement movement, no new industrial projects have been built in Jharkhand in the past 5 years. 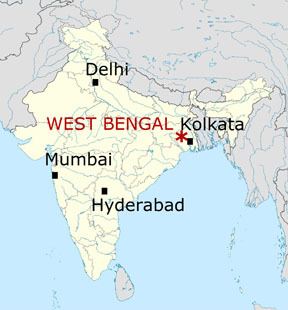 map In West Bengal, the CPI (Marxist)-led government has plans to grab 200,000 acres of land for SEZs, which will uproot a total of 2.5 million people. The first big test of this policy came at Singur in 2006, where the government sought to acquire 997 acres of fertile multi-crop land for an auto plant for the Tatas, the largest capitalist conglomerate in India. This project threatened to displace over 50,000 people. Farmers and villagers opposed to the land acquisition organized themselves in the Singur Krishi Jami Rakhsha Samiti (Committee for Protection of Agricultural Land). In early June 2006 over 2,000 villagers staged a demonstration at a government office with bullocks and agricultural implements. On the night of September 25 as local people gheraoed the government office in charge of the land grab, they were attacked by the police and CPI (Marxist) cadre. Dozens were injured, including many women, and one youth was beaten to death. This overwhelming show of force made it possible for the Tatas to start construction of the plant for the "Nano" car, slated to be the world's cheapest at 100,000 rupees, or about $2,500. By 2008, it had become clear that Tata had grabbed much more land than it needed for the auto plant. The SKJRS raised the demand for Tata to return half of the 997 acres to the cultivators. On August 9, I traveled north from Kolkata to Singur to join a procession (a long, winding march) of around 1,500 people through four villages adjoining the Tata plant. Since my visit to Singur, the anti-displacement movement has taken a new leap forward. In the first week of September 2008, tens of thousands of protestors surrounded the plant, blocking roads and preventing Tata workers from reaching the plant—effectively shutting down the final stages of construction of the plant. According to the September 3 New York Times, Tata announced that it still planned to start production in October, but was forced to scale back production from 40,000 to 10,000 cars per month. Since then, Tata has threatened to close down the plant altogether, and not return the land. During my stay in West Bengal, I had hoped to visit Nandigram, where tens of thousands of farmers and villagers rose up to defend their land in 2007. The people of Nandigram stopped the plans of the Communist Party of India (Marxist)-led government in West Bengal to build a giant chemical complex on their land. Even after two large-scale armed assaults by the police and CPI (Marxist) cadre that killed at least 25 people, the people of Nandigram have continued to stand their ground. While I was in Kolkata in the first week of August, there was intense fighting in the Nandigram area. CPI (Marxist) cadre were on a rampage, beating up anti-displacement activists, stealing their possessions, and forcing them to leave their homes. This made it impossible to visit the area. 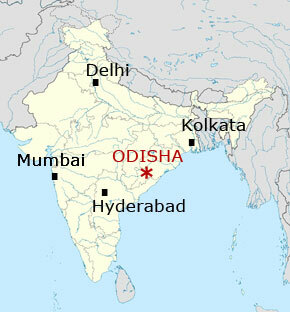 map My final destination was Orissa (Odisha), another resource-rich state with a large tribal population. I visited villages where Tata Steel and the South Korean steel company Posco are trying to grab land to build large steel plants. In June 2005, the Orissa government and Posco signed a Memorandum of Understanding for Posco to build a 12 million ton steel plant at Jagatsinghpur. This project will include a captive port nearby and 600 million tons of iron ore from mines several hundred kilometers away. Seven villages and 22,000 people will be displaced from 4,000 acres of land. In addition to the farmers who will be displaced, thousands of fisherman and villagers in the port area will lose their livelihood. For three years, Posco has been trying, unsuccessfully, to acquire the farmers' land. Farmers organized by the Posco Resistance Struggle Committee have kept the company from establishing offices in the villages, and have set up "check gates" at the entrances to the villages to check on the identification of outsiders and to prevent Posco from starting to survey and demarcate the land. Blocked in its land acquisition efforts, Posco has hired outside goons to destabilize the situation and provide a pretext to bring in police and paramilitaries. In the area of Kalinganagar on January 2, 2006, the Orissa police killed 15 tribals who were protesting the beginning of construction of the Tata Steel plant. After January 2, the Anti-Displacement Movement (ADC) grew stronger in the Kalinganagar area. The ADC's secretary, Rabindra Jarika, told me that for the next 14 months, they constantly stopped traffic on National Highway 215. "People came from different areas of Orissa and other states, including Posco, Nandigram and Kashipur, to support us. Only 5-10% of the local farmers have sold their land to Tata." Because of this movement, Tata Steel's construction work has stopped. This is a major blow to the efforts of the Orissa state government to make the Kalinganagar area into "the second most important steel city of the world." On the night of August 12, as we were returning from Kalinganagar, the car transporting us was pulled over by local police for a traffic-related reason. My translator Protima Das, my guide Pradeep, our driver and I were taken to a police station for questioning. For the next eight hours, all of us were interrogated, first by the local police, and then by one of the top police officials of the state of Orissa. The latter was particularly hostile, accusing me of being an "anti-government agitator." When I insisted that I was a teacher researching the issue of forced displacement in India, he insisted that only "communists" would be interested in speaking with villagers. Shortly before I left India, I heard that Pratima and Pradeep had been arrested and charged with serious political crimes that can keep them behind bars for many years. This is an outrage which has to be vigorously protested. Pratima and Pradeep are guilty only of being anti-displacement activists and introducing a foreign friend to the realities of India's villages and the devastating impact that capitalist "development" will have on millions of people in India in the coming years. I ended this trip impressed by several things. First, I had no idea how vast the SEZs and other industrial and mining projects are in India. In the next decade, it is no exaggeration to say that tens of millions of people will be threatened with displacement. This has taken center stage in Indian politics, and is beginning to make international news, as the recent coverage of the struggle in Singur against the Tata car plant demonstrates. Second, I did not know how widespread the Indian people's resistance to displacement is and how it has grown exponentially over the past few years. Everywhere I went, I encountered the determination of villagers to hold onto their land, even if it costs them their lives. I saw that Indian women, rooted in the land, are at the forefront of many anti-displacement struggles. And in numerous talks, I was struck by the high level of political consciousness of the villagers and anti-displacement activists, and their efforts to lend assistance to each other's struggle. Third, I learned how seriously the Indian state takes the anti-displacement movement, and are moving to derail it with lies about it being opposed to all forms of development and to destroy it by the use of armed force. I also returned convinced that international solidarity with India's anti-displacement movement is essential. The world needs to know about this powerful movement directly from those affected by displacement. This requires efforts like the International Campaign against Forced Displacement launched by the International League of Peoples' Struggle (ILPS). In order to move this campaign into high gear, there is a pressing need for a larger and more prominent Fact-Finding Mission to India. I hope that this report will spur the formation of such a mission in the coming months, and will contribute to the success of the campaign. David Pugh works with ILPS in the San Francisco-Bay Area of the US.